This post describes the definition and an implementation of the functions vector. Space of functions are commonly used in machine learning (kernel functions) and differential geometry (tensors and manifolds).The most common technique to create a functions space is to define the space as a category and assign monadic operations to it. Let's use andThen as the basic block to build our functions space. The andThen is a member method of some of the Scala standard library collections such as List and HashMap. 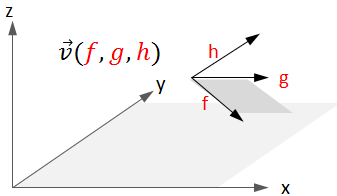 A function space is defined as a space of function vectors, similar to Euclidean space for which variables is defined as a vector or array of real values. A function vector is commonly used to convert a vector or tensor from one space to another non-euclidean space by transforming the original coordinates (x,y,z) to another coordinates in a different space (f(x,y,z), ..) using the function vector. Let's implement the functions vector as the class FunctionVector (line 1) and its two most important method, composition (line 2) and the dot product (tensor product) (line 3). The iteration along the function vector is implemented as a tail recursion. The method relies on the List[T=>T].andThen method (line 6). The 'dot' product takes another function vector of same size as argument. The two vectors are zipped to generate a Iterable[T=>T] vector of composed function elements using a map. Finally the resulting dot function is computed by generating a new function with summation of the elements of the composed functions vector. The summation requires the instance of Numeric to be declared as an implicit argument. Contrary to the andThen method, the map convert a function vector to another function vector by applying a natural transformation. 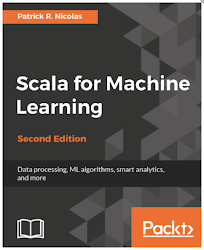 The aggregation method passed as argument of the dot method (line 3) is a simplified version of the aggregation defined in the Scala standard library. It is used to implement the dot method on the composed functions vectors (line 10). For evaluating our Function vectors classes, we used a list of functions of type Double => Double (line 1): a sinusoidal and a square root functions (line 2). Once the function vector is created (line 5), it is available to be composed with the existing list of functions of the class FunctionVector (lines 5 and 6).